I've got it! along with two different floor coverings in my family room. I've got gray rectangle tile by my side door, which then gives way to an old blue and gray square design Berber carpet. The real treat was discovering the faux brick vinyl covering after we removed the red brick wall and hearth. Clearly, we need some new flooring in this room. The adjoining kitchen has a similar blue rectangle tile. The remainder of the house has oak hardwoods. Our family room is the most used room in the house, so the flooring needs to be durable and easily to clean. Right now, I'm leaning toward cork. From what I understand, it is easy to install and can live up to my hard-wearing family. Anybody have cork? Do you love it? Let me know. Brick, tile, AND carpet? Weird! 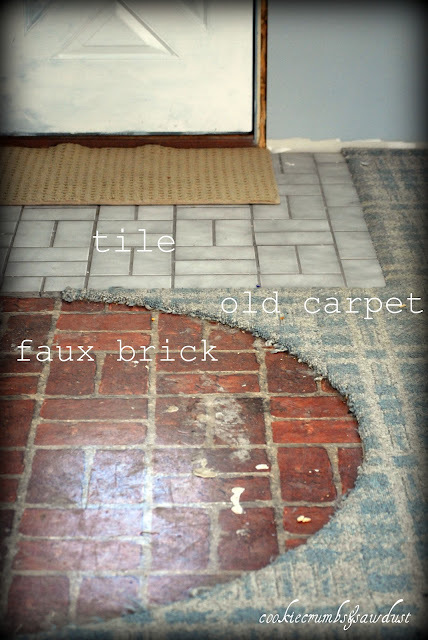 What was under the faux brick vinyl when you pulled it up?